Leave it to Mel Brooks to make Nazis funny, right? "The Producers," currently running at the Albuquerque Little Theatre, pokes fun not only of Hitler and the Third Reich, but horny, little old ladies, and pigeons who "Sieg Heil" salute, bringing the slapstick laughs to life. The plot centers around Art Tedesco as Max Bialystock, legend in his own mind, who realizes with the help of his accountant Leo Bloom, played by Dehron Foster, that a flop on Broadway is more profitable than a hit. Enter Ulla, the luscious blonde played by Emily Melville, who reforms one of the partners, and the help of Nazi-loving Franz Liebkind, the worst playwright the duo could find, played hilariously by Eliot Stenzel, and the partners are sure they can find happiness at last. But it's Mel Brooks. 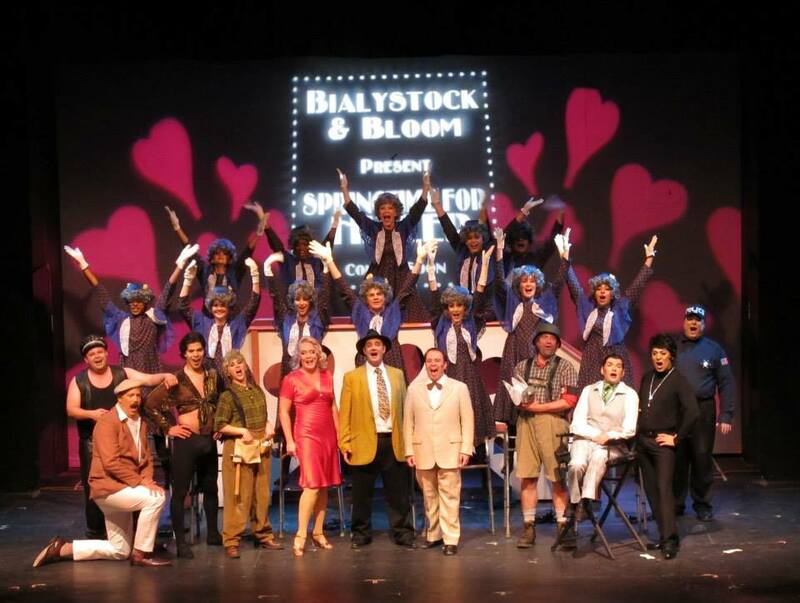 So, of course, even a musical as bad as "Springtime for Hitler" was intended to be, the critics loved it, and the flop becomes a miserable hit. The audience watches as the two, planning on making millions, instead make their way to jail (for one partner) and to Rio (for the other). 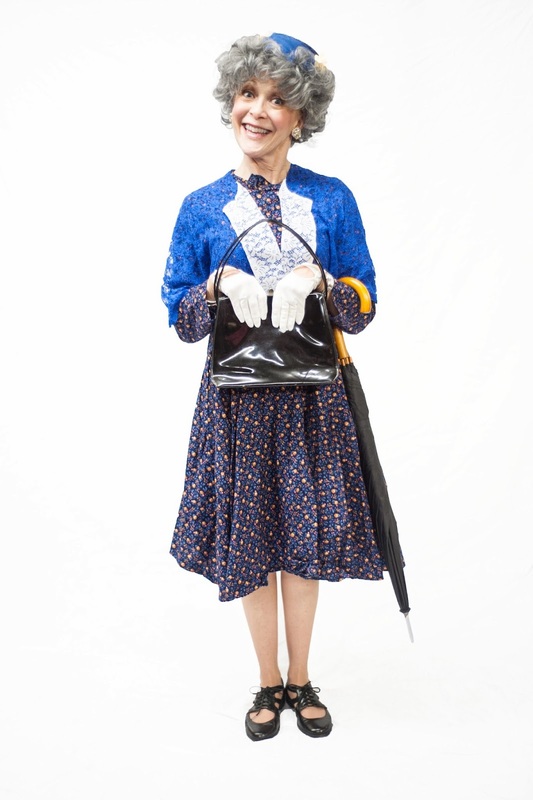 Directed by Henry Avery, the show maintains its Brooksian flavor, including classic moments such as a top hat and white tipped cane dance number, "I Wanna Be a Producer," and the incredible choreography of the Little Old Ladies, whose walkers join them as dance partners in the most giggly & innovative choreography imaginable in "Along Came Bialy." With lines such as, "I'm not going to the toilet, I'm going into show business!" the cynical humor of Mel Brooks shines through, poking fun and the cast, who is already vocally quite strong in this musical, plays the comedy up without forcing the laughs. Slapstick done wrong is painful to sit through... but slapstick done right keeps the audience smiling, enjoying the silliness. Not to be missed are two more performers whose "Keep It Gay" number delighted me, Daniel Tabeling as choreographer Roger De Bris (debris, get it?) and his partner Carmen Ghia, played by one of my new favorite comedic actors, Joe Moncada. If you saw Joe as Jacob in "La Cage..." earlier this season at ALT, you will recognize the flavor he gives his Carmen, another delightfully graceful, deliciously naughty comedic character. 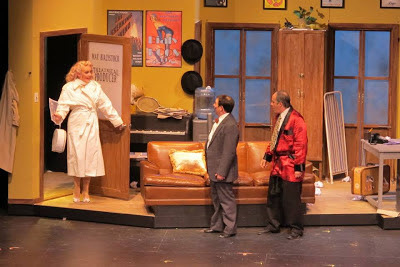 "The Producers" runs until June 16th at the Albuquerque Little Theatre, and for more information or to buy tickets online, visit www.albuquerquelittletheatre.org. 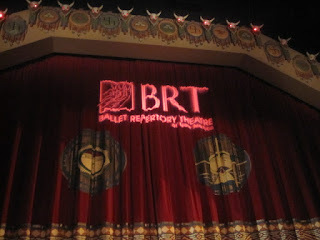 Classical ballet was my truest love for many years, so seeing Festival Ballet Albuquerque's performance of "Coppelia" was a joy to my classicist heart. 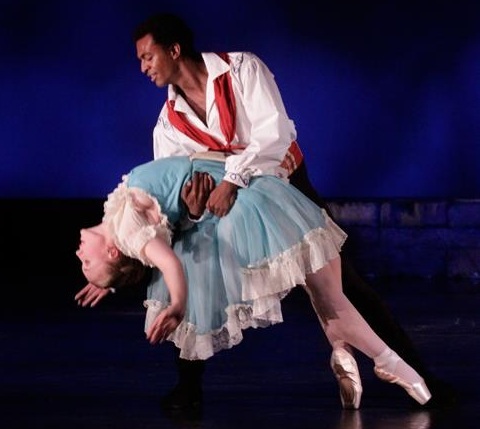 However, like so many dancers today, FBA dancers also showed their contemporary and even modern roots in other works on their most recent program, "Coppelia, Creation of the World, and other dances," performed May 10 & 11 at the National Hispanic Cultural Center. "Hungarian Rhapsody" started the evening, a light and playful duet with Louie Rocatto, and his partner Ludmila Malohkov, whose pointe work was strong enough to sustain the suspension required to convey the joyful airiness of the choreography, created by Patricia Dickinson Wells, FBA artistic director, Dominic Guerra, and Ludmila Malhokov. "Contineo" was an entirely different pas de deux, a contemporary ballet piece costumed in black that was slow and heartfelt, both choreographed and danced by Jennifer Boren and Dominic Guerra. With the focus on lifts, and weight suspension, the partners pushed past traditional ballet lines to find slightly different partnered shapes for this piece. 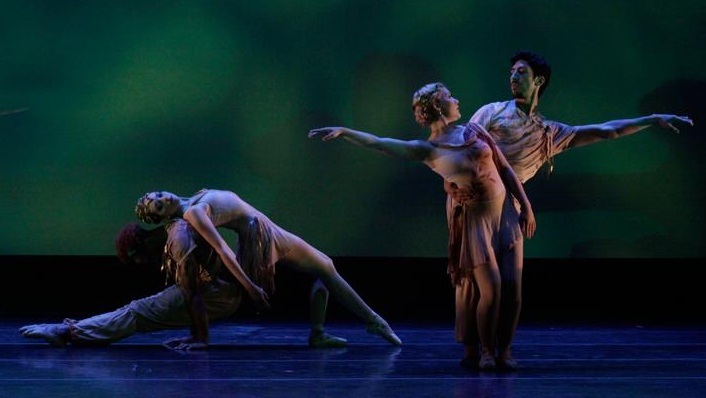 "Creation of the World" finished the first act, a longer piece with scenes that unfolded, including the abstract characters "Human Origins," danced by Natalee Maxwell and Trey Pickett (far left). Younger members of the junior company had the chance to perform as well, playing the "First Creatures" as well as the "Little Beginnings," while company professionals expanded the creationism theme, as the four primary couples who develop in the moment. The music's shifts in tempo and mood allowed the story of transformation to be told in a way that was dynamic and changing. "Coppelia" comprised the entirety of the second half, presented as a one-act suite of dances which allows the story ballet to be told without interruption. What remains charming in this story is as true to modern audiences as when it was created in 1870, that being the capriciousness of mankind. While maintaining the most classical form of ballet tradition in choreography, the silliness of Dominic Guerra's Franz swooning over the doll Coppelia, as well as the jealousy and mischief in Lora Sturm's Swanhilda, all came through. Not only do the leads get to have their comedic moments in Coppelia, but many more characters throughout the show, including the toymaker Dr. Coppelius, danced by Louie Giannini, Jr., and Swanhilda's girlfriends who join her in breaking into the toymaker's shop. Especially magical was the moment when all of the toys suddenly came to life, bringing another smile to the faces in the audience. For more information about Festival Ballet Albuquerque and their upcoming classes and workshops, visit www.FestivalBalletABQ.com. 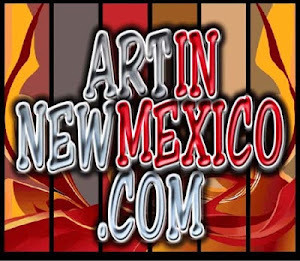 Ballet Repertory Theatre of New Mexico's third show of each season always promises something a little different than the classical works they are known to showcase. "Pasion!" was an evening of dance presented by the company on May 4 and 5, and comprised of three choreographers' works, all with a Latin or Spanish theme. Katherine Giese's opening number "Huapango" was set on four couples, and felt light and airy in the joyful expressiveness of the dancers. Unlike most of the works the company performs, this evening was presented in soft slipper, which gives the dancers an entirely different way to approach their movement. Loren Fletcher Nickerson's work completed the first act, with eight different pieces, each a unique expression of his artistic journey taking place within the atmosphere that our state provides. 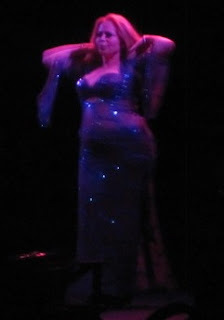 Art by Kym Loc, as well as other projections played on the scrim behind the dancers, never upstaging the choreography but allowing an alternative vision for the audience to experience. 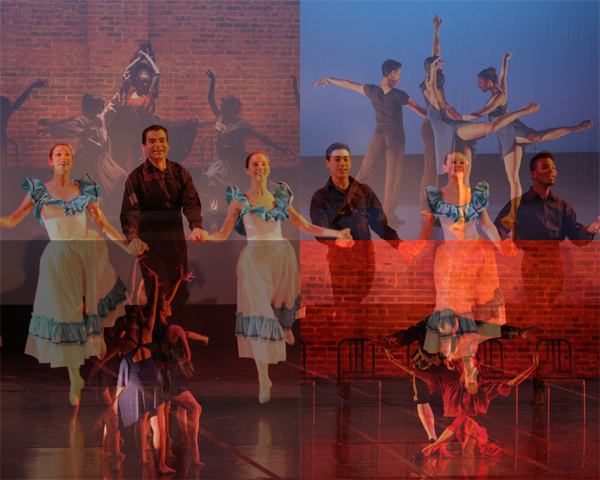 The opening piece, danced by Loren himself, introduced the theme of self discovery, and included spoken word, in Spanish, to allow for another dimension within the movement and art. Loren's contemporary ballet style required the dancers to look within themselves to find the characters meant to express each dance's mood, from languorous such as Mirra McFadden, Erika Ray and Victoria Stines in "Clouds on a Mesa," to the playful "Sister Tango," with Christina Daly and Briana Van Schuyver. Other company dancers were strong in duets, such as "Love Times Four" and in group works, such as the final number, "Red cinnamon sky," where Antonio Lopez had a particularly strong solo moment. The second act comprised of Alex Ossadnik's "Carmen," set to music by Rodion Shchedrin after George Bizet, a version which allows the story to be compressed and presented without interruption. This year marks the third time Alex's "Carmen" has been presented by BRTNM, the first being in 1998 -- which I had the good fortune of seeing! -- as well as 2006. This newest cast included Christina Daly, whose haunting and dangerous Carmen was strong and heartfelt. However, Carmen's story would be nothing with Don Jose, danced brilliantly by Giacomo Zafarano. His sacrifice for Carmen shapes the tragedy of the story, and as such requires a dancer who can bring the level of artistry and story telling to the choreography. One of my favorite moments played out almost exactly as I remembered it from 1998, the "rope dance" between Don Jose and Carmen, where the two tangle, pull, release and entrap one another. When done well, props can allow the performer to not only delight the audience with the ingenuity a prop provides, but also to allow them to develop their character's story. This is one crystalline moment that I was gratified to see play out again, 15 years since I last laid eyes on it. Martin Murphy's Toreador was a chance for him to reprise his role, as he was cast in each version, and has always brought a level of haughty arrogance, and curious disdain as he interacts with Carmen. The moments he has traversing the chairs, always seeing himself above Carmen, better than the lowly factory woman, speaks to his ability as a dancer to overcome the challenge of the moment and deliver. Also elevated within the show is the character Fate, danced by Briana von Schuyver, who was the only dancer of the evening to perform in pointe shoes. Performing in mask as well, she embodies the otherworldly force from which Carmen can't escape, and Briana brilliantly used her expressiveness in her movement alone, without the benefit of facial expressions to tell the tale. For more information about Ballet Repertory Theatre of New Mexico, visit www.BRTNM.com. A cabaret these days has become a great way for artists soon to depart our Land of Enchantment to give their swan song. However, "Hungover Together" was less of a swan song and much more a true life love story between four friends, two of which have left after the run of the show to pursue their NYC dreams. Written and conceived by Gilbert Sanchez and Jessica Fisher, the autobiographical musical weaves together events from the forgotten night before by going through the clues left behind. Each clue leads the friends into another scene from their debauchery, and each becomes a new story to tell, all of which they insist are true. Drinking from the barrel of a shotgun (novelty glass) to wearing a Marilyn Monroe dress commando style, and even a naughty red headed wigged, Ariel the Mermaid impression... all true? For real? Performed with Jonathan Gallegos and Marilyn Valencia and accompanied by Paul Roth, the humor of the cabaret was bawdy and bright. Trading off karaoke and modifying existing musical numbers were other numbers performed by the group, in solos, and duets as well. One particular favorite I had, "What the f*** was that?" takes place as Jessica (playing Jessica) clutches Gilbert (playing Gilbert) as they stumble through the horrors of the late night bar crowd. Staged at the Musical Theatre Southwest Black Box theater, and directed by Hal Simons, the intimate setting allowed the performers to sing without body mikes, and with the kind of audience immediacy that sitting mere feet away from the drama onstage can produce. While drinking, and drinking, taking videos and pictures of each other and their escapades, and still drinking, Jess and Gilbert spend the evening singing, dancing, fighting, and making up, like any duo is prone to do under the influence of alcohol and devoted friendship. Best of all was how they chose to end the show... by sharing via projector screen the real life evidence of their many nights of true debauchery, just as the show depicted it... pictures and videos of the times they've shared, and exactly how they played them out for us to see in the cabaret. I have a soft spot for these two, we performed together in "Jesus Christ Superstar" in Fall 2012 and so it is bittersweet yet joyful to see them leave for other opportunities. Sending best wishes to these talented two performers, and hoping they take many more bows from many more stages in their future. This past weekend "Invaders of the Heart: Revival," a belly dance showcase of the Pomegranate Studio's three companies, delighted many within the intimate setting of the Maria Benitz Cabaret at the Lodge of Santa Fe. As the studio's founder, primary choreographer, costume designer and artistic director, Myra Krien brings her unique vision of belly dance to the stage in a grand fashion each Spring, coincidentally in the same place this year where the company first performed in 1998, over 15 years ago. The "Revival" program featured traditional Oriental choreography, as well as American tribal style and flamenco fusion pieces, and Krien's Belly Baile style, her own creation. A dazzling smatter of props added to the show, including not only traditional veilwork, but also Burlesque-style fluffy feather fans, and Asian veiled fans which made a delightful dragon effect in the number, "Geisha's Tears." Solo numbers and ensemble pieces comprised the two sets, with moments of humor, and personal expression, interspersed. The special guest performer this year was award-winning dancer, filmmaker and graphic artist Cecilia Rinn, who not only performed, and taught workshops during her visit, but also held a special screening of her film, "Belly," a documentary that explores family, body image, sisterhood, female empowerment and spirituality through the medium of belly dance. Jade McLellan's performances were particularly strong this year, an artist who has developed on stage for us to watch since 2006. Now the Acting Director for their apprentice company, her own solo numbers were powerful in characterization as well as technical ability. The program notes Jade is moving on, and it was a joy to witness her artistry once more before her possible Pomegranate Studio departure. Creative costuming is second nature to Krien, whose design skills are put to use creating her clothing line, as well as her creative expressions onstage. This year, cute fedoras and pantaloons adorned the gypsies, while other more traditional costumes were seen, and flamenco accents within the second act allowed greater characterization for the dancers to express themselves with. Local dancers may wish to attend Krien's upcoming workshop, on May 19 at Farfesha's in Albuquerque, and her upcoming performances can be seen in Santa Barbara, Ca. as well as Maui, Hi. This summer, she will be starting her current session of her SEEDs Teacher Training program. SEEDs was originally developed as a way to nurture and educate young women in a positive fashion, using belly dance as well as other means of self expression and empowerment, a model which now has 14 other programs nationwide based on the same model. Unique to this year, Krien will also be offering her first Sophia workshop, a four-day retreat in July based on the SEEDs program but designed for women. For more information about Pomegranate Studio, visit www.pomegranatestudio.org or email pomegranatesfnm@yahoo.com.